How much does Wolf Track Software cost? What operating system do I need to be able to run Wolf Track Point of Sale Software? What kind of help and support does Wolf Track offer? 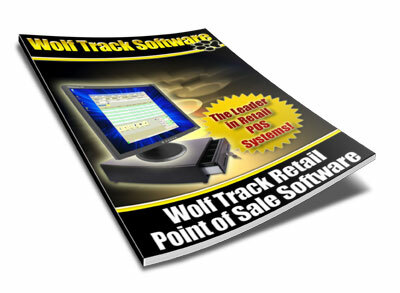 What type of stores use Wolf Track Point of Sale Software? What are the minimum requirements for Wolf Track Point of Sale Software? Does Wolf Track provide online help? Does Wolf Track offer a hardware package that would include all the hardware I need? Does Wolf Track Software offer a multiple store discount? Wolf Track Software only costs $30.00 a month per register. That is less than a cup of coffee a day. You can also add on special services like Off Site Backups and Special Database Connections at an extra cost per month. Wolf Track Software will run on Windows XP, Windows Vista and Windows 7. Wolf Track Software help and support is free. Our U.S. based phone support hours are 9:00 am to 5:00 pm CST at toll-free (918) 794-1544. Our e-mail support is 24 hours a day 7 days a week by either going to our website contact us page or by sending us a e-mail at support@wolftrack.com. Wolf Track Software is being used in a variety of small to medium-sized retail stores. Our customers include hundreds of Liquor Stores, Video Game Stores, Costume and Party Supply Stores, Hardware Stores, Clothing Stores, as well as many others. Yes. We have online help documents and videos that will guide you through most of the features in Wolf Track Point of Sale Software. Yes. We do offer discounted pricing for multiple stores. Please contact us at (918) 794-1544 for pricing details. No. You can purchase Wolf Track POS Software at anytime without any contracts to sign.